How Can I Register Easy File Undelete? MunSoft Company always puts the clients first, that’s why there’s a trial version of the program. You don’t have to pay in advance and waste money on a product that you’re not even sure will work on your computer. This trial version gives you a chance to see the files before the recovery, using a built-in preview window. If the information there is displayed correctly, then your files will be recovered exactly as they are shown. If the program cannot preview your files, then unfortunately, it won’t work for you and won’t recover anything. Three files can be restored as a test but only one file at a time. You’ll need to obtain a registration key in order to get rid of all the restrictions. free updates to any version 3.x. 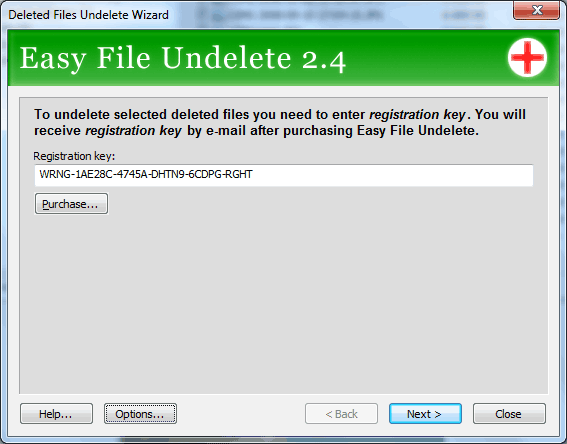 How Do I Register Easy File Undelete? This page can be accessed when you launch the program and hit the “Buy” button. After the purchase is processed, you’ll be sent a registration key to your email. Paste your key to the registration window and hit “Next”. As an alternative, you can enter the registration key if you go to the main menu and choose “Help” and then “Enter a registration key”.